Georgetown, Guyana – (November 22, 2016) RE-ESTABLISHMENT of public trust has been a key commitment of the current administration. Fundamental to that public trust is a transparent process for allocation of resources and spending from the public purse. Transparency empowers citizens to hold governments and public administrations accountable, and allows the public sector itself to monitor and audit its own activities. Additionally, it is the basis of good governance and the first step in tackling corruption. One core area of governance within which transparency is essential is public procurement, a process which speaks to the awarding of contracts to qualified contractors, suppliers and service providers. Public procurement plays a unique role in the execution of democratic government, as public awareness and understanding of government practices helps to improve the public’s confidence in governing systems. Article 212W of Guyana’s Constitution holds: “There shall be a Public Procurement Commission the purpose of which is to monitor public procurement and the procedure therefore in order to ensure that the procurement of goods and services and execution of works are conducted in a fair, equitable, transparent, competitive and cost effective manner, according to law and such policy guidelines as may be determined by the National Assembly”. The Procurement Act was passed in 2003, but the Commission was officially established only in October 2016, following the approval by the National Assembly of the five nominees submitted by the Public Accounts Committee. Establishment of this Commission is a significant one for this administration, as, while in opposition, both A Partnership for National Unity and the Alliance for Change had lobbied for the removal of Cabinet’s “no-objection” role in the procurement process. Prior to establishment of the Commission, Cabinet held full powers in the procurement process, a method that did not allow for decentralisation in the awarding of contracts. The previous administration had held that Cabinet should still play a role in spending sums from the public funds, which contributed to the years-long delay of the Commission’s establishment. 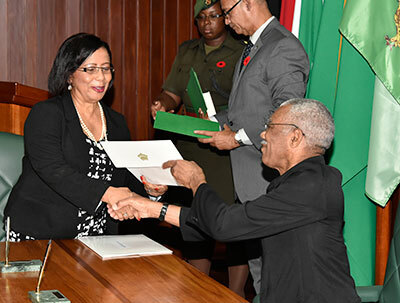 President David Granger has said that establishment of the Commission indeed creates more transparency in regard to the award of contracts for public projects. “This is very important. It will remove from Cabinet the obligation of sorting out contracts, so it will be a transparent process. I think the public can be assured that, under our administration, there will be greater vigilance and scrutiny of projects and less cronyism… It is something we fought for, and which will work for the benefit of all Guyanese,” the President said. 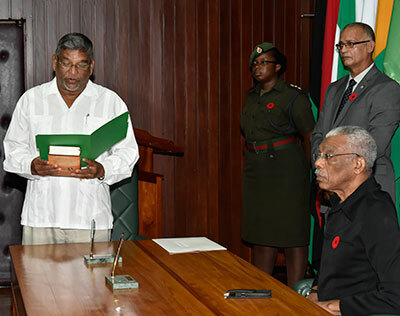 The five members of the Commission were sworn in by President Granger on October 28 last. Those members are: Chairman of the Commission, Ms. Carol Corbin; former Programme Manager of Administrative Services and Procurement at the Caribbean Community (CARICOM) Secretariat, former Minister of Labour Dr. Nanda Kishore Gopaul; Principal of the Critchlow Labour College, Mr. Ivor Burnette English; Senior Lecturer at the University of Guyana, Mr. Sukrishnalall Pasha; and Attorney-at-Law Ms. Emily Dodson. The President has charged the members of the commission to uphold the sacrosanct tenets of the Constitution, and to be independent, impartial and fair in the execution of their duties. He noted that the selection of the members by both sides of the House is testimony to the greater need for the Commission, despite political differences. 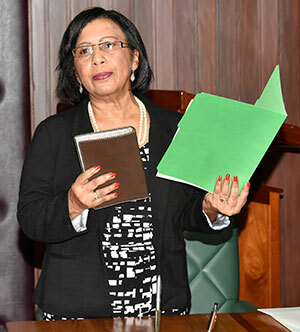 “The Government of Guyana iterates its commitment to the principles of accountability and transparency in the conduct of public business. The establishment of the Commission evinces the importance of ensuring equity and fairness in public procurement,” the President has said. 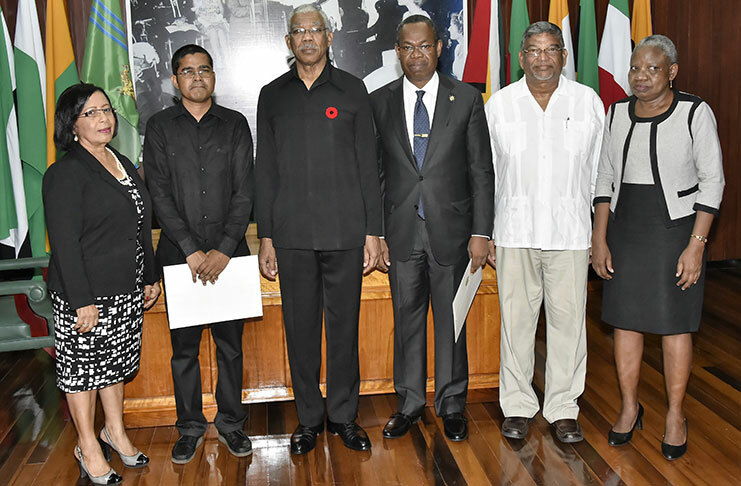 President David Granger and members of the Public Procurement Commission at the swearing in ceremony: (from left) Chairman of the Commission, Ms. Carol Corbin, Mr. Sukrishnalall Pasha, Mr. Ivor Burnette English, Dr. Nanda Kishore Gopaul and Ms. Emily Dodson. Vice President and Minister of Public Security, Mr. Khemraj Ramjattan, expressed at the ceremony that the establishment of the commission was one of the campaign promises of the coalition government, and he said it is an accomplishment to have the commission up and running. “This is one of our biggest lobbying points — to get proper accountability in this country; and I am so proud that it has happened in the first half of our term, after waiting for more than a decade,” he said. The PPC is an oversight body which monitors the procurement of goods, works and services to ensure the process is fair, equitable, transparent, and competitive; and that it functions as has been laid out in detail in the Constitution. Speaking on the importance of transparency to the procurement process, Mr. Pasha, during a panel discussion with some members of the Commission, stated that transparency would induce confidence in the procurement system, and this would further reduce financial and non-financial hardships. “The way we would go about ensuring transparency is by ensuring all established procedures are followed by the procuring entities,” he said. Such established procedures, Mrs. Corbin added, include the implementation of standard documentation and that the bidders understand these documents. Moreover, Dr. Gopaul, said, the road to transparency requires that notices of tenders are published, that the results following the decision-making process is communicated to all applicants, and that these applicants are given a chance to raise any complaints or dissatisfactions they may have. Such methods, the members of the Commission believe, would provide for true fairness and confidence to be developed in the system. “We have been meeting since the swearing in, and I am really impressed and pleased with the quality of discussions and the knowledge of the members and the leadership we have been given,” Dr. Gopaul said. With administrative tasks at the top of the Commission’s immediate agenda, he said the work that has so far been achieved within a two-week period is impressive. “I think the personalities on the Commission and the quality of leadership speak well to the future of the Commission,” he said. These administrative tasks include the recruitment of senior officers to staff the Commission, seeking a permanent location to house the Commission’s head office, and meeting with key stakeholders, such as the National Tender Administration Board, the Auditor General, and over 40 procurement entities. “The National Tender Administration Board (have) been executing the functions of the Commission pending our establishment, so it is very important that we meet with them, to get clarity as to what they were doing, where they are now, and to organise the transition,” Mrs. Corbin said. She added that the meetings with the procurement entities would seek to establish the methods through which they procure goods, works and services; whether they are adhering to the guidelines of the Act; what their practices are; if they are properly staffed to undertake these functions; and if there is proper training of officers. “We are therefore responsible for conducting training programmes (for) procurement officers as well as contractors, to ensure they understand the rules and receive proper documents,” she said. The establishment of the PPC is evidence of this Government’s commitment to the principles of accountability and transparency. The Chairperson assured that the Commission has a very robust public procurement system planned, and that once persons are properly trained and there is adherence to the law and regulations, there will be equity, transparency, fairness; and that persons would be satisfied with the process. Moreover, Mr. Pasha believes that once the public confidence is ensured, any concerns surrounding public procurement would be reduced. “We are confident that by inducing confidence in the system, all the stakeholders will be more confident,” he said. Meanwhile, Dr. Gopaul has said that now that the Commission is established, the public is now naturally looking on to ensure that the system runs smoothly and with integrity, and that there is adherence to regulations and the Constitution. “The public can look forward to get justice, and that the country will benefit tremendously from the transparent process. Once we have a transparent process, everyone is a winner: the procurement entities, the contractors, (nobody has anything) to fear. We will make Guyana proud,” he said. Together, the members of the Commission possess rich professional experience in areas such as public service, procurement and financial management, economics, law, human resources and other core areas that would assist in effective management of the Public Procurement Process, thus they would be greatly empowered to effectively execute their tasks.